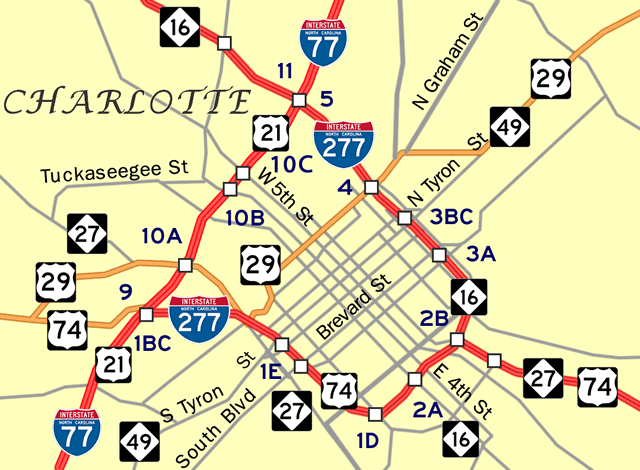 Interstate 277 encircles the central business district of Charlotte to the east of I-77 and U.S. 21. The north end connects with North Carolina 16 (Brookshire Freeway) leading northwest toward I-85. U.S. 74 overlaps with I-277 along the John Belk Freeway from Wilkinson Boulevard to an expressway along Independence Boulevard east. 0.75 miles from the multi level interchange with Interstate 77/U.S. 21 on I-277 west & N.C. 16 (Brookshire Freeway) north. I-77 travels north from Charlotte to Statesville where it meets I-40 and south to Rock Hill just across the South Carolina line. Photo taken 10/05/01. North Carolina 16 extends 1.75 miles northwest from I-277 and I-77 along the Brookshire Freeway to Idaho Drive. Photo taken 12/99. Exit 5A leaves I-277 north for I-77 & U.S. 21 north to I-85 north and Huntersville. N.C. 16 (Brookshire Boulevard) meets I-85 at a SPUI in 2.2 miles. There is no access to I-77 south at this exchange. Photo taken 10/05/01. I-77 & U.S. 21 advance 1.5 miles south from the exchange with Interstate 85 to Exit 11 with the Brookshire Freeway. Photo taken by Chris Patriarca (04/07/03). Exit 11 parts ways with I-77/U.S. 21 south at the Oaklawn Avenue overpass for both N.C. 16 (Brookshire Freeway) west to I-85 and I-277/N.C. 16 east around Downtown Charlotte. Photo taken by Chris Patriarca (04/07/03). A half mile ahead of Exit 11A for I-277 & N.C. 16 (Brookshire Freeway) south on I-77/U.S. 21 north. Photo taken by Chris Patriarca (04/06/03). I-277 & N.C. 16 angle southeast through the Greenville community to U.S. 29 and the Fourth Ward outside Downtown Charlotte. The state route follows I-277 for 2.47 miles to East 3rd Street. Photo taken by Chris Patriarca (04/06/03). N.C. 16 (Brookshire Freeway) spans Irwin Creek at the off-ramp for I-77 & U.S. 21 south. Interstate 277 begins here. Photo taken by Chris Patriarca (04/07/03). The first confirming marker for I-277 south / inner loop stands within the exchange at I-77 and U.S. 21. Photo taken by Chris Patriarca (04/07/03). A loop ramp (Exit 5A) joins N.C. 16 south with I-77 & U.S. 21 north two miles to Interstate 85. I-277 advances 1.7 miles south to U.S. 74 (Independence Boulevard). Photo taken by Chris Patriarca (04/07/03). With Bank of America Stadium on the horizon, Interstate 277 southbound passes Exit 1E for Stonewall Street, 1.25 miles ahead of I-77 & U.S. 21 (Exits 1C/B). Photo taken by Chris Patriarca (04/06/03). Exit 1C departs I-277 south for Interstate 77 & U.S. 21 north. U.S. 74 continues from the freeway end to U.S. 29 along Wilkinson Boulevard via Exit 1A. Photo taken by Chris Patriarca (04/06/03). U.S. 29 arcs north from I-277 along Morehead Street, crossing I-77/U.S. 21 just ahead of the exchange with U.S. 74 (Wilkinson Boulevard). Photo taken 10/05/01. Exit 10A leaves I-77/U.S. 21 south for U.S. 29/NC 27 (Morehead Street). A loop ramp (Exit 9) follows for I-277/U.S. 74 east. Photo taken 10/05/01. A collector distributor roadway separates from I-77 south for Exit 9 to I-277 (John Belk Freeway) east and N.C. 160 along West Boulevard. Photo taken 10/05/01. U.S. 74 overlaps with I-277 for 2.36 miles along the John Belk Freeway from Wilkinson Boulevard to Independence Boulevard east of Downtown Charlotte. Photo taken by Chris Patriarca (04/06/03). 0.75 mile guide sign for the c/d roadway joining I-77/U.S. 21 north with I-277/U.S. 74 (John Belk Freeway) east and U.S. 74 (Wilkinson Boulevard) west to U.S. 29/NC 27 (Morehead Street). Photo taken by Daniel Davis (12/02). Two lanes partition from I-77 north for the c/d roadway to I-277 and U.S. 74 (Exit 9). I-277 returns to I-77 in 1.8 miles. Bank of America Stadium, home of the NFL Carolina Panthers, lies 0.6 miles to the east via the John Belk Freeway. Photo taken by Daniel Davis (12/02).